Sursy is the ultimate gifting resource for the modern woman. We work with local and regional makers and artisans to source the very best in stylish gift choices. Then, we pair those gifts with items needed to wrap the gift, all at no additional cost to the customer. It’s our way of encouraging and simplifying the gifting experience. Sursy aims to become one of the hottest online shopping destinations in the Southeast. We believe in supporting local and regional makers (many of which are in Greenville) and expect to become the go-to platform for the stylish gifter. Pop up shopping events are one of the biggest things that inspired us to create Sursy, so we decided to begin hosting Pop Up events of our own! 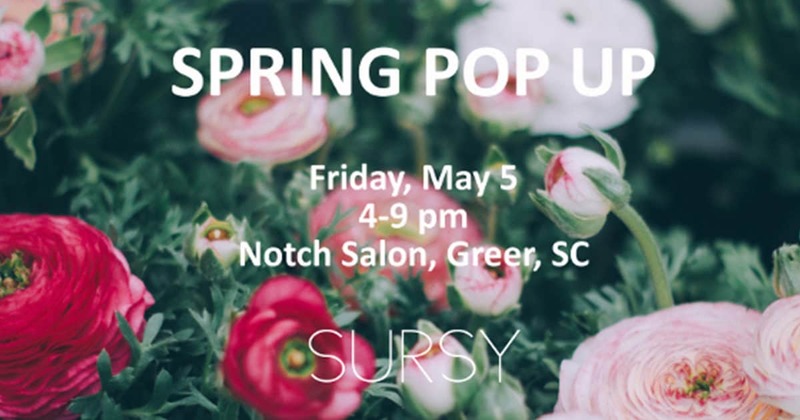 Our first event is next Friday, May 5, from 4-9pm at Notch Salon in Greer. We will have all products listed on our website available for purchase and will even provide complimentary food and wine for shoppers. We also will feature a “Happy Hour” special from 4-6pm, where shoppers can receive 10% off their purchase. And, as always, every purchase intended as a gift will include free gift wrapping supplies. When: Friday, May 5th, 2017, from 4:00 p.m. to 9:00 p.m. Opening Saturday May 13th, 10:00 a.m. to 3:00 p.m.